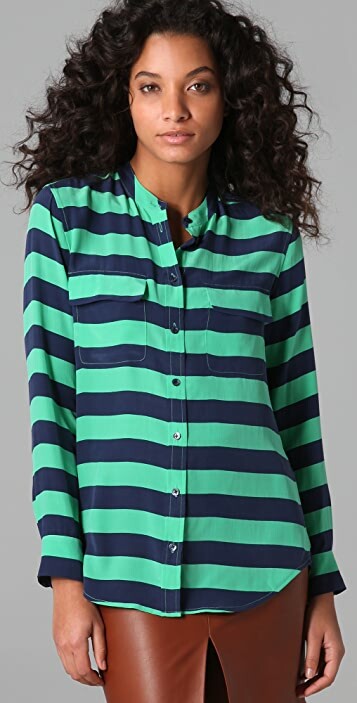 This striped silk blouse features a stand-up collar and an 8-button closure. Flap pockets at bust and box pleat at back. Shirttail hem. Adjustable 3-button cuffs. Long sleeves. * 27" long, measured from back shoulder. This shirt has the most amazing colours which are right on trend. Great fabric and constructed well for the price. Only thing to note is that the large is not as large as the traditional Equipment shirts, so expect it to be quite fitted and tailored. Looks better tucked in than out.